Here is a list of project conducted and/or supported by ADERSIM and ADERSIM researchers. 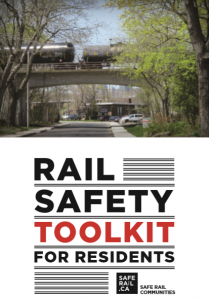 Led by Safe Rail Communities this project developed a rail safety toolkit to spread awareness about the hazards associated with rail emergencies – including derailments, collisions, and the release of hazardous materials into natural environments and communities. The goal of this toolkit was to provide people and communities with clear information about rail safety and dangerous goods that can assist in emergency preparedness efforts at both the household and community levels. Understanding the key mechanism of step-by-step transitions of the food-pathogen L. monocytogenes within a host is significantly important for risk evaluation and reduction. This project will develop an agent-based simulator to imitate the gastro-intestinal pathway of L. monocytogenes. The biological factors such as pH variation, digestion process, stomach emptying time and pathogen factors such as survival fitness will be added to the features of the simulator. The simulator will consider the effect of food-matrix such as liquidness and fat concetration in the survival of pathogen. The effect of food intake time and randomness of pathogen distribution in the food portions will be also taken into consideration. 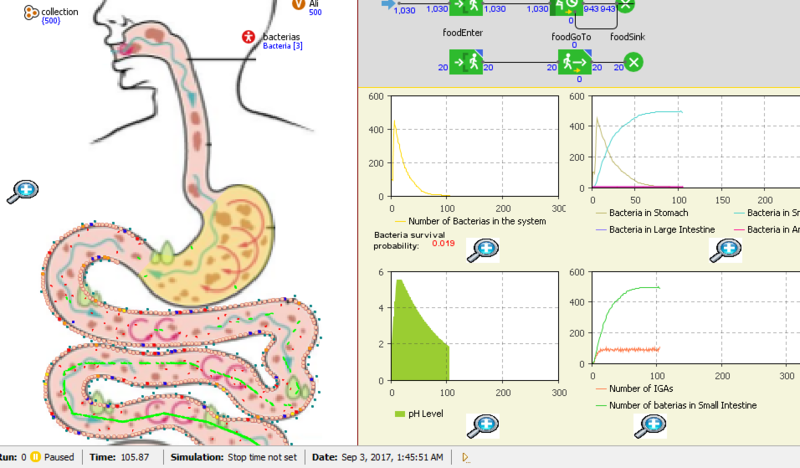 The simulator featured by the key physiological processes will account for the pathogen survivability in the gastro-intestinal tract of human hosts. This research project was initiated to develop a simulation engine leveraging the National Fire Information Database (NFID) in order to provide fire departments across Canada with a data driven tool for evidence-based planning and response to fire incidents, thereby helping them create safer communities. Canadian Association of Fire Chiefs (CAFC). Canadian cities, towns, municipalities, regions, and provinces experience various types of major disaster and emergencies. Major disasters and emergencies are not just bigger than everyday emergencies that fire departments normally respond to them. They can quickly overwhelm fire departments. They may require the application of different performance standards and protocols. While fire departments are proficient at planning and preparing for normal operating conditions and some of them have great experiences with large emergencies, better understanding and preparedness for disaster events is more challenging. Knowledge of the expected situations and preparedness lead to better fire response during such events. Understanding the nature, volume, characteristics and response performances of fire departments during major disasters and emergencies is very important. 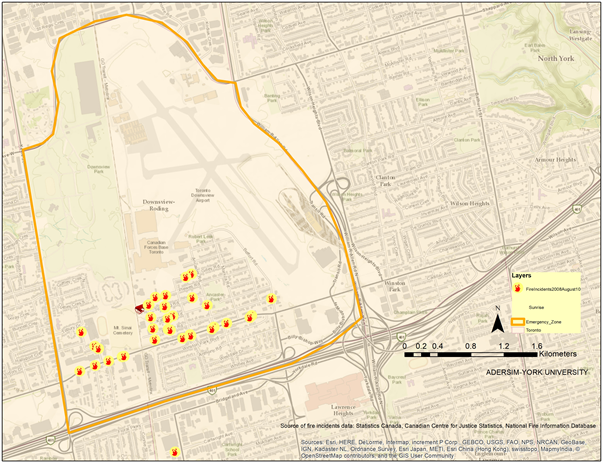 This study aims to provide some insights into the patterns and characteristics of fire incidents during major disaster and emergencies in Canada using the National Fire Incident Database (NFID). Fires and High-rise Buildings in Canadian Cities, Urban Affairs Association 2018 UAA Annual Conference, Toronto, April 4-7. Jenaro Nosedal-Sanchez, Ali Asgary, Adriano O. Solis, Jianhong Wu, 2018, "Fire Response Time Variations in Urban Areas Under Normal and Large Emergencies: Case of 2013 Toronto Ice Storm and Flash Flood Emergencies", Urban Affairs Association 2018 UAA Annual Conference, Toronto, April 4-7. 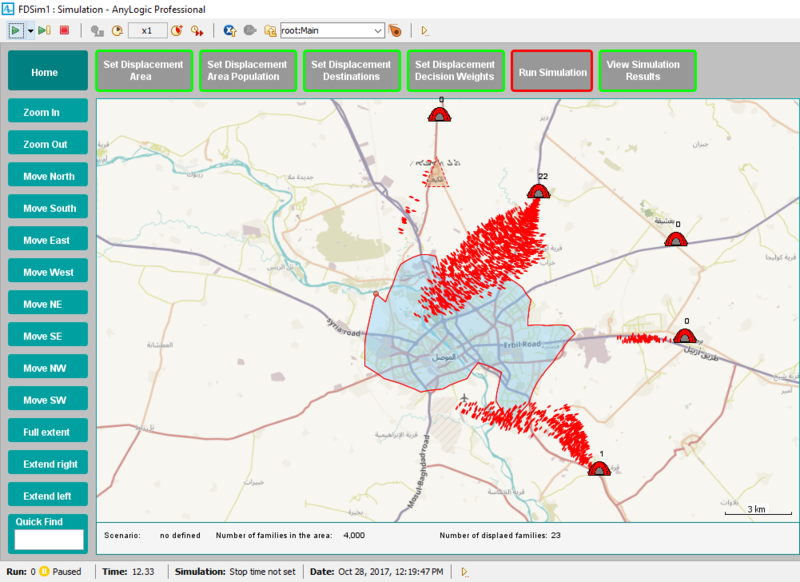 As part of the bigger project, this project aims to develop an agent-based simulation application for forced displacement caused by various factors such as conflicts, natural hazards, climate change, etc..
Nosedal-Sanchez, J., Asgary, A., and Solis, A., Longo, F., 2017, “MODELING AND SIMULATION OF FORCED POPULATION DISPLACEMENT FLOWS USING COLORED PETRI NETS”, DHSS 2017 Proceeding, Barcelona, Spain. Asgary, A., Solis, A.O., Longo, F., Nosedal, J., Curinga, M.C., and Alessio, L.E., "An Agent-Based Modeling and Simulation Tool for Estimation of Forced Population Displacement Flows in Iraq" Proceedings of the 6th International Defense and Homeland Security Simulation Workshop, Larnaca, Cyprus, September 2016, 75-81. Asgary A., Nosedal-Sanchez, J., Pantin, B., Wu, J., and Shafei-Sabet, M., “Testing and validating a disaster mutual assistance decision support tool for electricity companies”, Int. J. Business Continuity and Risk Management, 7(4). Asgary, A., Pantin, B., Emamgholizadeh Saiir, B., and Wu, J., (2017) "Developing disaster mutual assistance decision criteria for electricity industry", Disaster Prevention and Management: An International Journal, 26(2), pp.230 – 240. Asgary A., Pantin, B., and Selvadurai, A., 2017, “Disaster Mutual Assistance Management Application for Canadian Electricity Companies”, ESRI Canada Education and Research Conference, University of Toronto, October 11, 2017. Asgary A., Pantin, P., and Borowitz, J., 2015, “Developing a Mutual Aid Decision and Simulation Support Tool (MADSIM)”, North Atlantic Mutual Aid Assistant Group (NAMAG) Conference, Toronto, 26-27 October, Toronto. The purpose of this project is to investigate the eﬀectiveness of how a mobile app integrating augmented reality and GPS technology can inﬂuence crowd behaviour in the themed entertainment industry. The study used AnyLogic Simulation system to measure how Disney characters can act as a crowd mitigation tool can inﬂuence crowd movements throughout the Magic Kingdom. 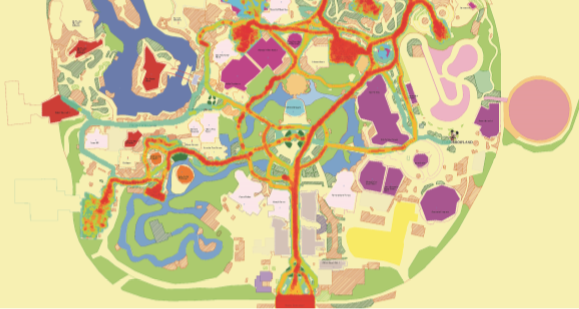 Using data to represent park entrance rates, attraction duration, and wait times, the study was able to capture the level of inﬂuence Disney characters had on park guest’s movements throughout their visit. This simulation reveals that Disney characters have the ability to inﬂuence crowd behaviour with a probability rate of 30%. This data supports the view that the proposed mobile app will act as an eﬀective crowd mitigation tool and can strategically inﬂuence crowd migration throughout the Magic Kingdom. Air transport represents the fastest way of moving people and goods. For this reason, it is critical to the global economy and the welfare of society. The resilience of air traffic networks is, therefore, of great importance. In the past two decades, various events have shown that air transport is vulnerable to disruptive events, such as extreme weather, terrorist attacks, volcanic eruptions, earthquakes, and pandemic influenza. The severity of the impacts on passengers and economic activities, and overall losses to stakeholders and for society in general, would highly depend on the vulnerability and resilience of these networks. 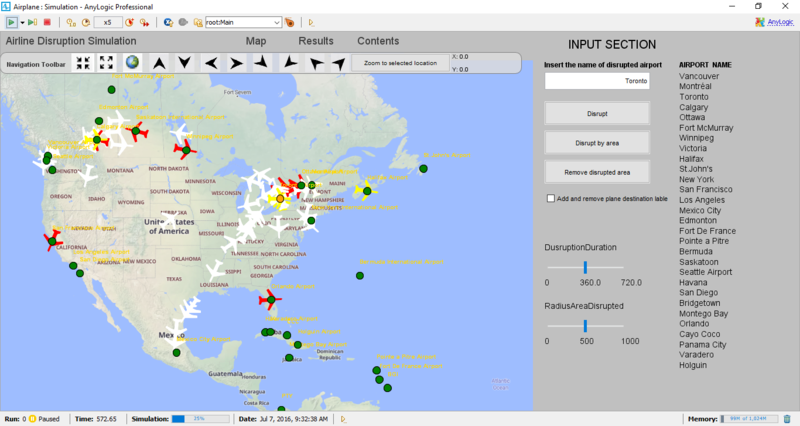 The current research seeks to develop an agent-based model to simulate and analyze the vulnerability and resilience of airline routes to airport disruptions. Asgary, A., Nosedal, J., Solis, A.O., Longo, F., Alessio, L.E., and Curinga, M.C., "Simulating the Impacts of Airport Closures on Airline Route Network" Proceedings of the 18th International Conference on Harbor, Maritime & Multimodal Logistics Modelling and Simulation, Larnaca, Cyprus, September 2016, 86-92.